Weather-wise, it's almost always summer here, but it only truly feels like summer to me when I can spend a whole day as I like. How has your summer been? These photos are from a relaxing morning some months ago, when we drank tea and made plans for A's wedding. Thank you, Stine! I love the tones that Kodak Gold produces too. Maybe I should get a couple of kodak gold this weekend too. Nice photographs by the way! 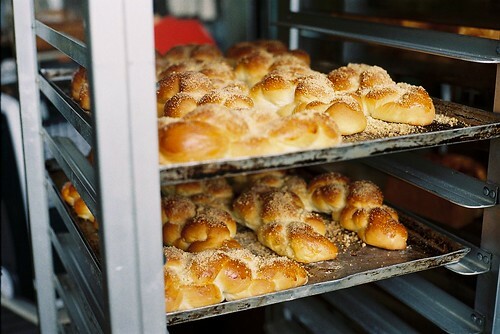 seeing the trays of buns just makes the smell appear! I know, right? Every time I see this photo, it makes me feel like getting some bread to eat! Hi! I wanted to stop by and say, first of all, i love your blog, and i love these photos. 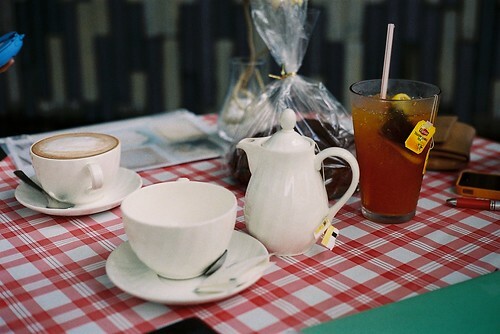 Second, I absolutely love these photos -- nothing like a relaxing morning of breakfast and tea. And third, thank you for the sweet comment on my blog. I love the support bloggers offer one another, no matter where they are in the world. Cheers!